If you can't find the information you're looking for, please submit your question to the support team so we can assist. The support team will continue to update the FAQ section based on your questions and feedback. 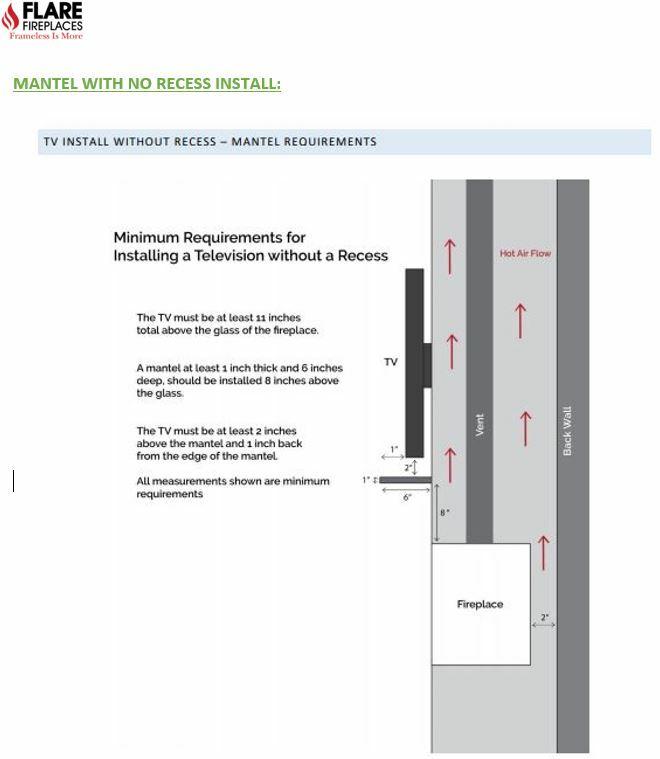 Below are the steps in trouble shooting the F-04 error code on our modern linear fireplaces. 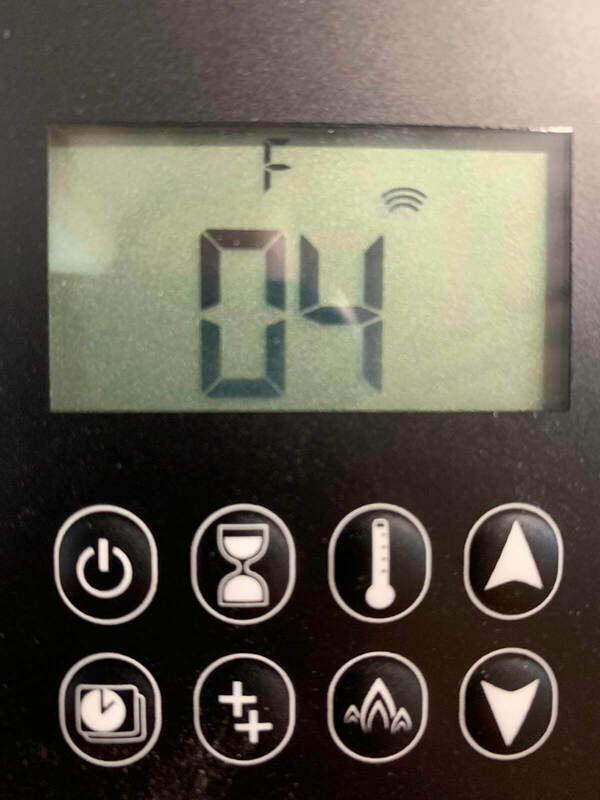 F-04 is a code that will flash on your Symac GV60 Maxitrol Flare remote when the valve fails to receive the message that the thermocouple has been warmed by the pilot. This failure can have multiple different causes that we will need to trouble shoot. The second thing to confirm is whether or not you are getting spark at the pilot. 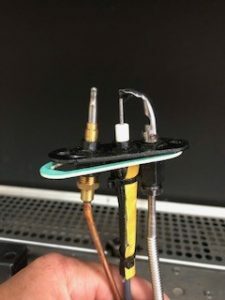 There have been cases where the spark cable has been disconnected from the spark plug or receiver, or a break has formed in the cable exposing the wire. Even though you hear the unit sparking, it may just be sparking underneath the fireplace and not at the pilot. 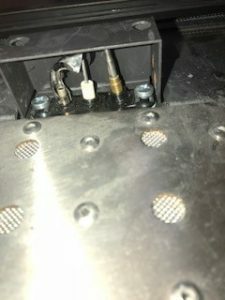 This can be done by looking through the holes in the pilot cover or by taking a look under the pilot hood for the indicating flash of spark. The third thing to confirm is that no media has become lodged under the pilot hood causing a blockage at the pilot opening which will not allow gas to be released and come in contact with the spark. 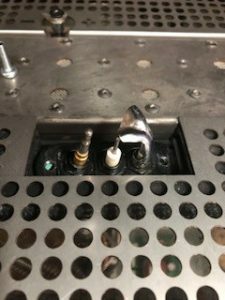 The last thing to check is to make sure the thermocouple isn’t broken, kinked, or that lead ball inside the valve at the end of the thermocouple hasn’t been over tightened and crushed. Flare Fireplaces can be easily converted from NG to LPG. When you place your order for a fireplace, include the gas type, NG or LPG so no conversion is necessary. The procedure below can be followed in the event a gas conversion is needed to be done. Please note: only Authorized Flare Technicians will convert units from NG to LPN, therefore, gas conversion done by any unauthorized technicians will void the Flare Fireplace warranty. 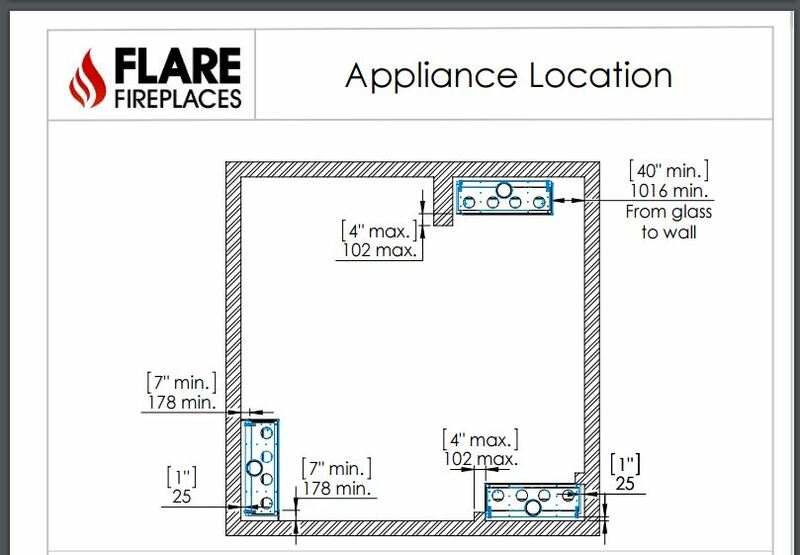 Contact Flare Fireplaces for details on your unit valve pressure setting (step 8). Use the pictures below and Flare Install Manual to gather additional information. Gas conversion kit should be ordered from Flare Fireplaces prior to starting this procedure. First of all, be sure there is no gas being fed to your unit. Technicians must also remove power to any added features. As a result, your unit is safe to open closed lines. 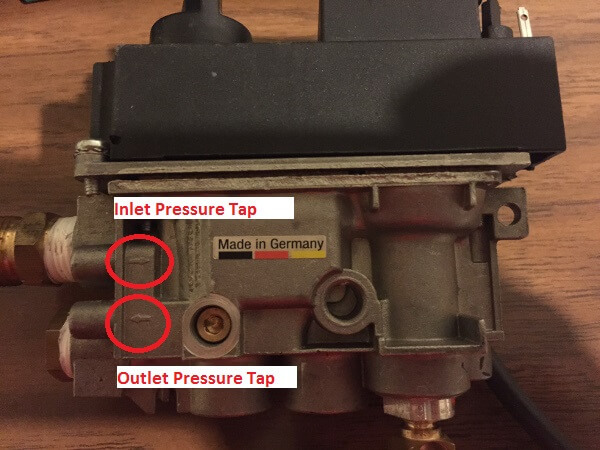 Optional – Lay the unit on its back to gain easy access to the burner orifice. 1. Confirm the correct specs of the unit needing the conversion. 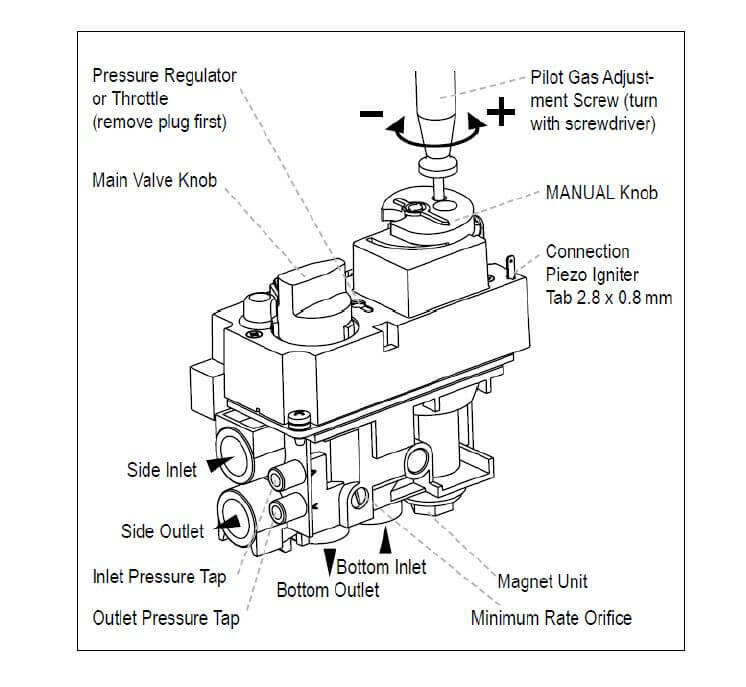 On that specification sheet, the correct orifice size and manifold pressure are listed for the specific unit. Spec sheets are located on the products page. 2. Remove burner Orifice. Be advised: Units 60″ and larger are equipped with 3 burners. All burner orifices will need to be changed in order to ensure safe operation of fireplace. 3. 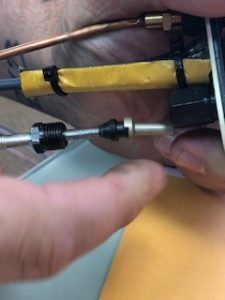 Technician note: The orifice housings have flared heads and will seal if threaded correctly. This results in a closed gas system with less hassle. 4. 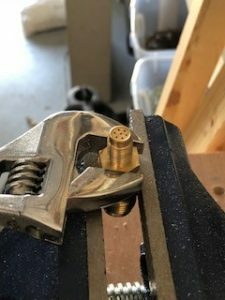 Replace Burner Orifice; while properly aligning threads when re-connecting. 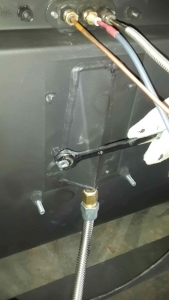 Finally, reinstall orifice housing into burner port and reconnect gas line. 5. To gain access to the Pilot Orifice, remove the Pilot Orifice Assembly. 6. 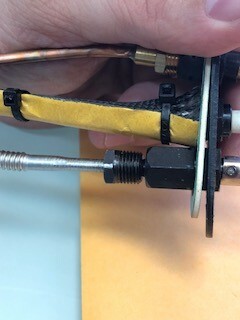 Replace Pilot Orifice; while properly aligning threads when re-connecting. 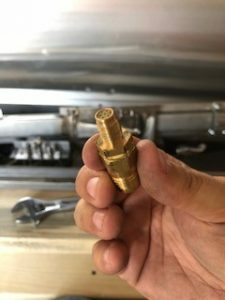 Finally, reconnect the gas line and remount the pilot assembly. 7. Close the unit air shutter in order to alter unit BTUs. 8. 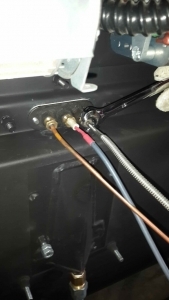 Techs will call Flare Fireplace support to adjust BTU on the gas valve to ensure high quality flame results. 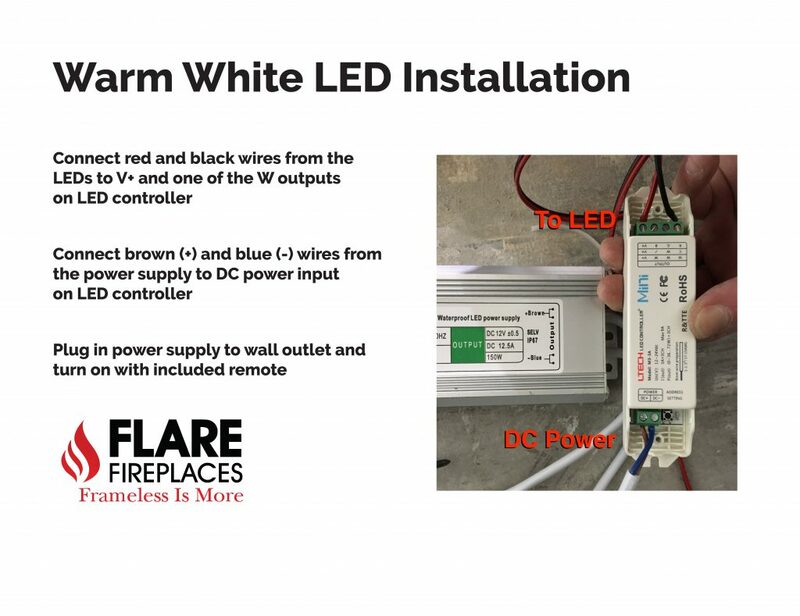 Because Flare wants to fit as many projects as possible, we offer the ability to install both the Commercial System & Residential System. Most importantly giving flexibility for many more projects, providing another level of convenience to our customers. Below you can learn the differences between the Commercial & Residential systems Flare offers. Double Glass, included by default in Commercial System. Wider unit to cool the glass even more. (compared to residential) (FF and ST units only). Commercial fans for cooling between the glass. Support for ON/OFF simple wall switch. Use phone application or remote control. Optional Power Vent with a vent as small as 3×5″. Option of SK for summer operation with minimal heat. Safety Screen, included by default. Choice of Classic Media to fill Fireplace. Standard width unit for narrower application. Double Glass upgrade available to include blower fans for cooling between the glass. Read more about additional Flare Features Here. Follow the link to see Commercial fireplace in action. Warm White LED lights are one of the many modern features available for your Flare. These lights are optional, & add a vivid glow, creating an amazing scene inside your fireplace. So whether you want a more modern styled look, or a more traditional appearance, Flare has you covered. 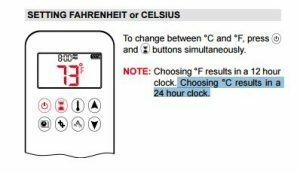 Changing Celsius to Fahrenheit, & vice versa, on the Flare 8-Button remote can be done by pressing the ON and Counter down button. Because Flare also serves the Canadien Market it is important to offer both units seamlessly. For a clear outline of the process see the image below. The change in the setting may happen during an attempt to start the fireplace by pressing both buttons. Duravent is one of two venting manufacturers certified to work with Flare Fireplaces. The flue pipe should be 3×5, 4×6, or 5×8 diameter concentric pipe, B-Vent will not work. Below you will find the specific cut-out size for each component. 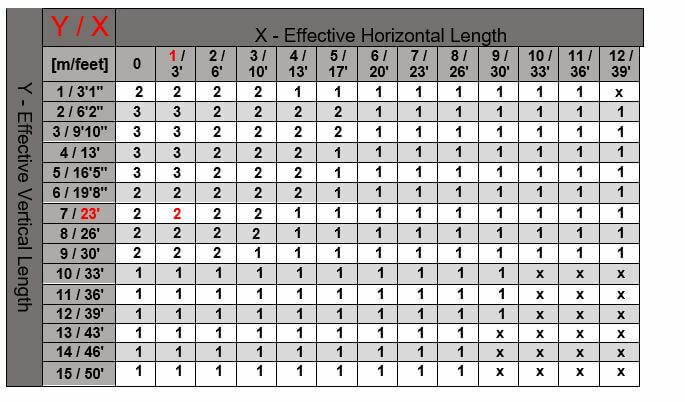 Finally, use the chart to verify the cut-out dimensions for your job. *Most importantly, if you have any questions contact Duravent for further assistance. Because the table is taken from the Duravent Install Manual you’ll find more details at http://www.duravent.com. 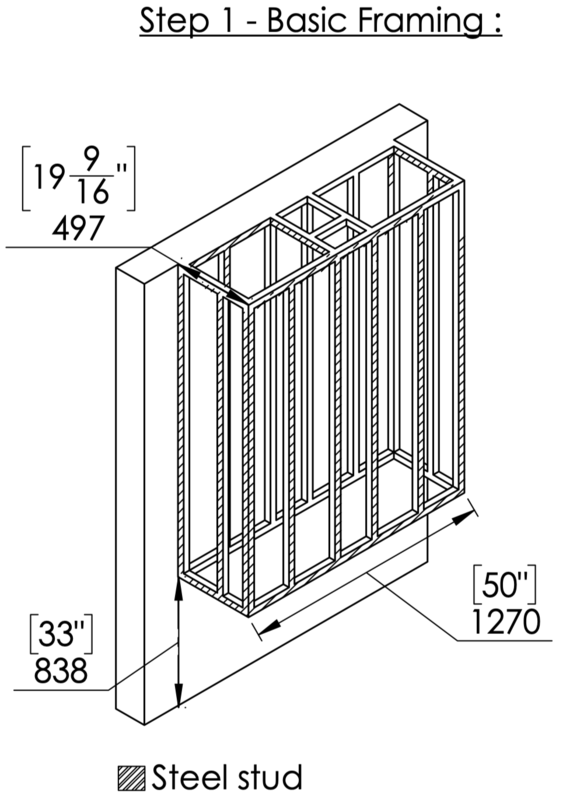 Framing is one of the easiest things to get wrong on a Flare Fireplace installation. See the example below for the correct framing on a Flare DC-50. For CAD Details & More In-Depth Spec Sheets Please Follow This Link. Clearances for your Flare Fireplace are paramount for the safe, long-term, sustainability of your fireplace & fireplace enclosure. Our fireplaces are remarkably efficient, so creating a safe distance from combustible materials is most important. 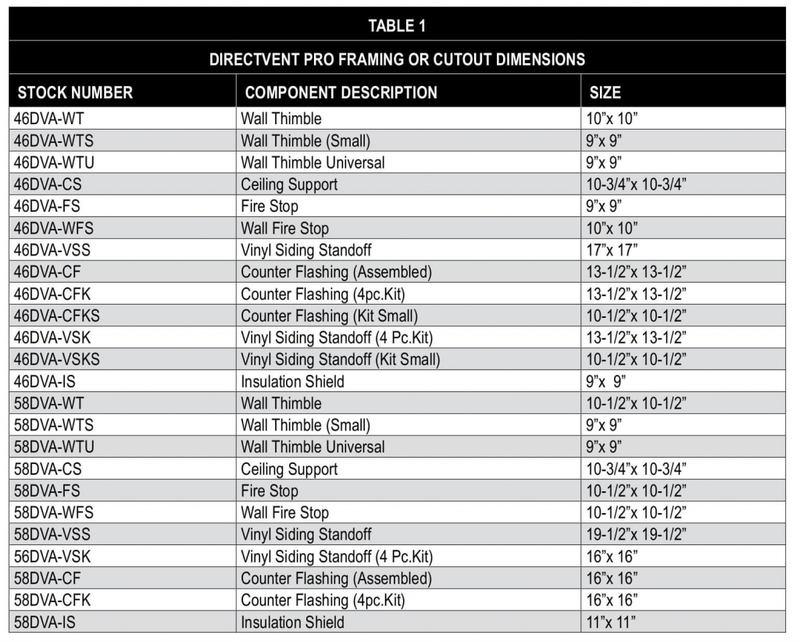 Also, the clearance specifications are very important, so we are providing a basic guide to use when framing your Flare Fireplace. Most Importantly, for more information of Clearances please refer to the Flare Installation Manual. 2” to Combustible. Combustible cannot be exposed behind/side of the Fireplace. 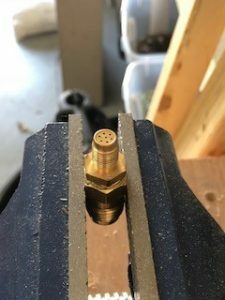 Cover existing corners, walls and wood studs or any other combustible metrical with Non-Combustible (Cement board or Type X fire rated, ~ 1/2 ” thick or). Install fireplace 2” from the Non-Combustible back. in case of a side wall next to the front glass, install Fireplace 4″ from the side. Back: fireplace is 2” from back Non-Combustible & 2.5” from the covered Combustible existing material. Side: Fireplace is 4″ from Non-Combustible and the fireplace glass is 7″ from the side wall. See chart below. Red line showing reflective heat from the glass. Best option for corner unit that are installed in an existing homes and a chase is built around it. Construct the walls and studs on the back and side of the fireplace from Non-Combustible material. Metal studs and cement board. Clearance of 1” from Metal studs and Non-Combustible material. Any Combustible is covered with Non-Combustible and is 2” away. In case of a side wall, keep fireplace 4″ from the side wall. 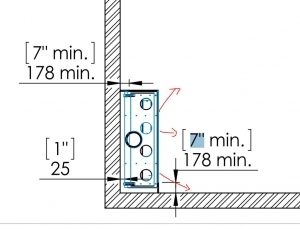 Any stud above the unit must be metal in both options above. 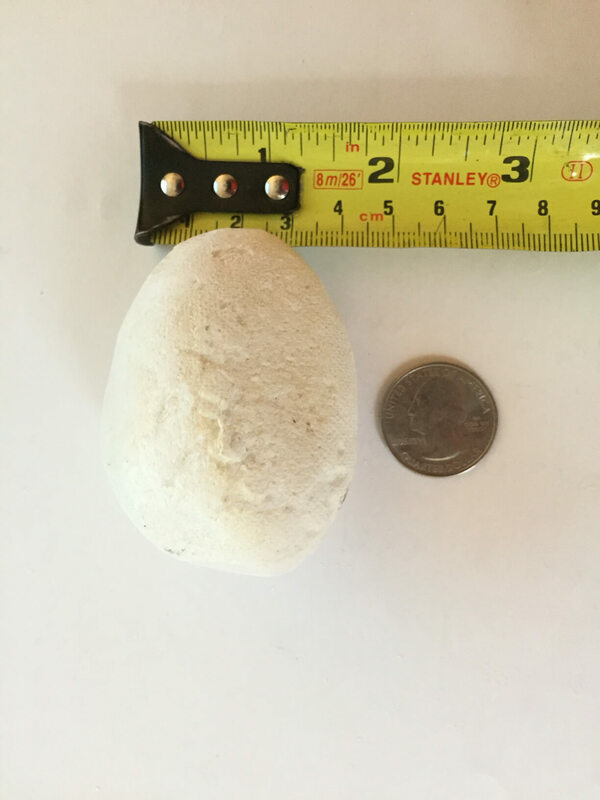 The pebbles size will vary and is approximately 2 – 3 inches. 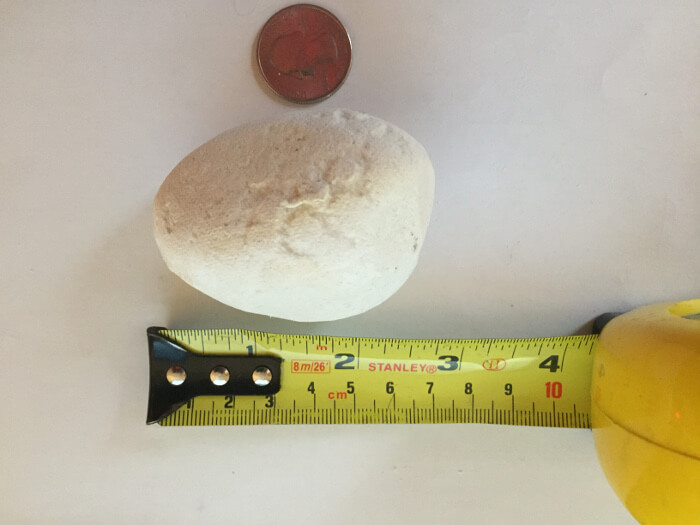 See below picture for a better perspective of the pebbles. 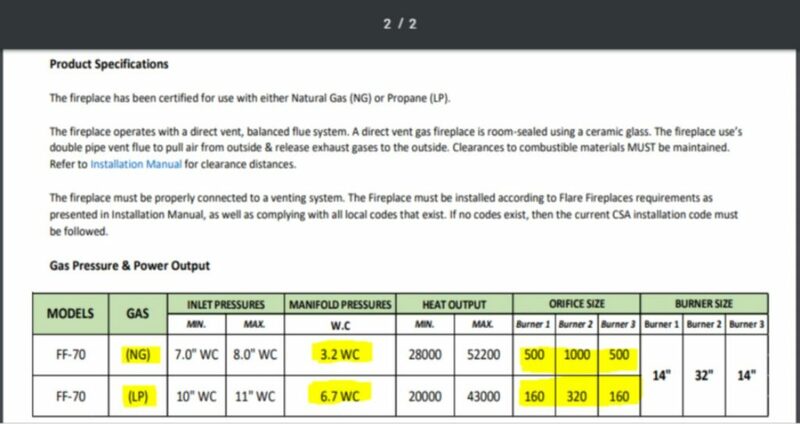 See below for Flare modern fireplace GV60 gas value, inlet and outlet test ports. All of Flare frameless fireplace share the same gas valve system . 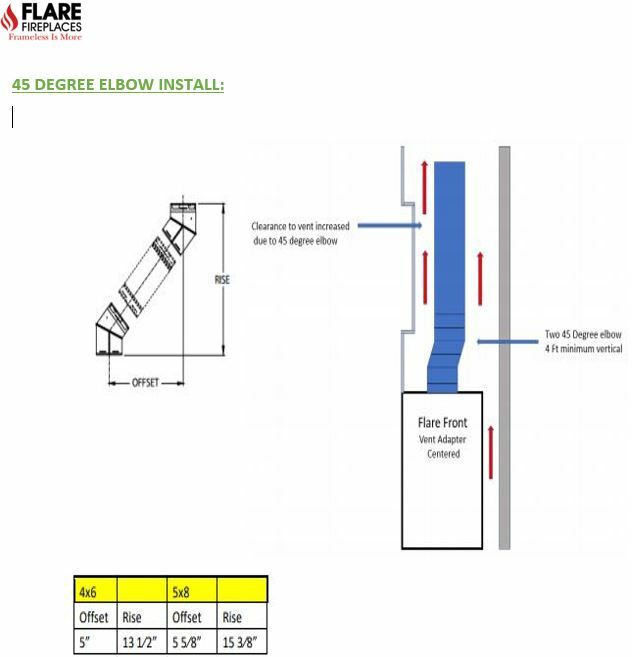 The Flare-DC framing instructions includes a 4″ max measurement requirement to a side wall. The requirement is due to the fact that the side glass will radiate heat like a front glass of a fireplace. Yes, it does. The Flare Fireplace uses an advance gas valve, GV60, that supports home automation. The GV60 gas valve will operate through an external source, such as a home automation system, by using the 5-wire pin connector on the receiver. 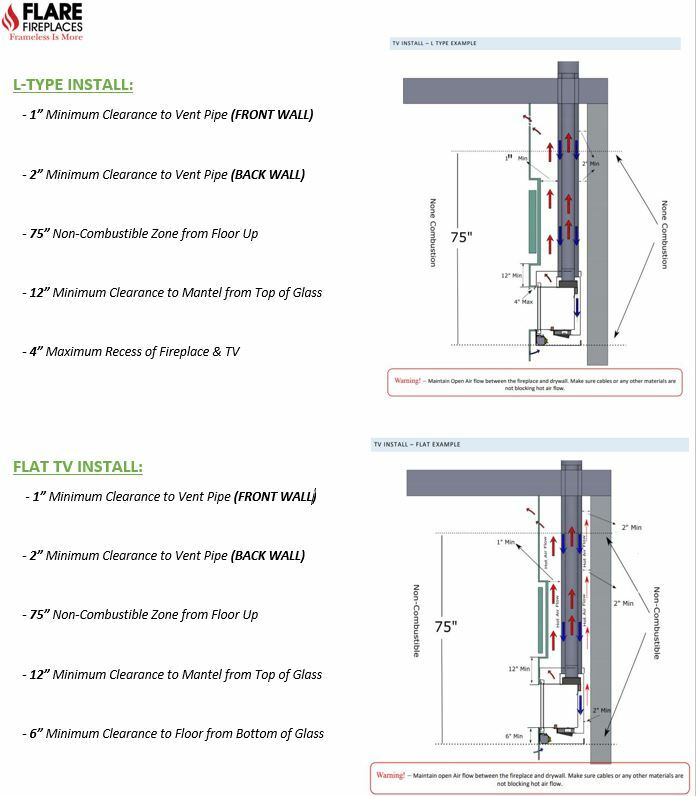 Flare Fireplaces recommends using 3 Ft of vertical run before any bend or turn. In some install scenarios it is possible to use less than 3 Ft. Please contact Flare Fireplaces support team for vent path review & approval (free service) when wanting to use less than 3 Ft. 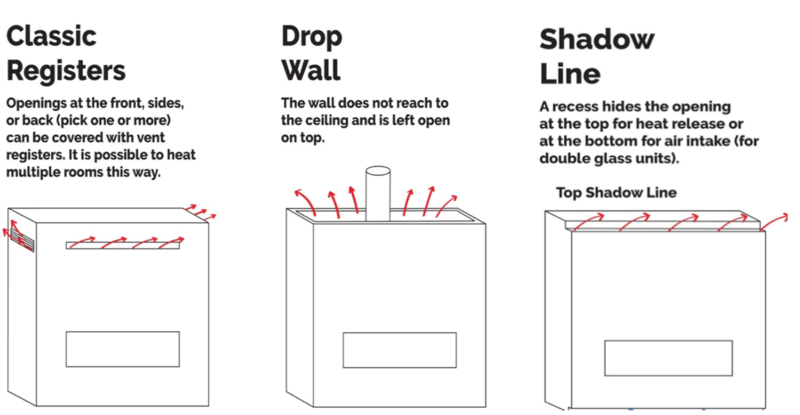 The outlet vent must be at the top/bottom part of the enclosure but not necessarily at the front (Can be at the back, sides, and top, in case of a drop wall), as long as the measurements below are maintained. at the front, as long as the measurements below are maintained. Lower vent opening – Optional for normal installation. A Must for double glass installation or blower kit option. Warning: Turn off the fireplace, and allow time for the unit to cool before proceeding. Caution: The ceramic glass is very fragile, and should be handled with care. Step 1 – Remove lower trim by releasing the screws. The number of screws will depend on fireplace size. Step 2 – Attach glass suction cups to the glass and release the glass upper frame. 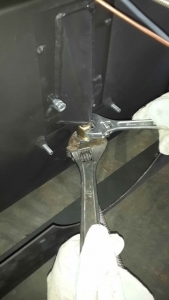 The upper frame is attached with 10mm spring bolts. The top glass trim gap will open once bolt is released and will allow the glass to be removed. Upper trim will stay attached and only open to be able to remove external glass. Step 3 – Tilt the bottom of the window frame and rest it in the gap between the external frame and glass holder. Step 4- Tilt the top of the window frame and lift out to clear the top edge of the unit. Place the window frame in a safe place to avoid damage. Repeat the steps above in reverse order to install the external glass back. The firebox front legs will need to be assembled during installation but only for corner fireplace models (Flare-DC, Flare-RC, Flare-LC). The Corner glass does not allow for the front leg to be pushed in full during shipping. Flare-Front and Flare-See Through will have the telescopic legs assembled during shipping and should not need to be assembled. What are the firebox inside finishing options? The default inside firebox finishes is black metal. It is also optional to get the inside firebox back installed with black ceramic glass (mirror effect). The black ceramics glass reflects the flames and since it is made from ceramic glass it is guaranteed to last. The black glass reflects the flame but does not look like a mirror when the fireplace is off. 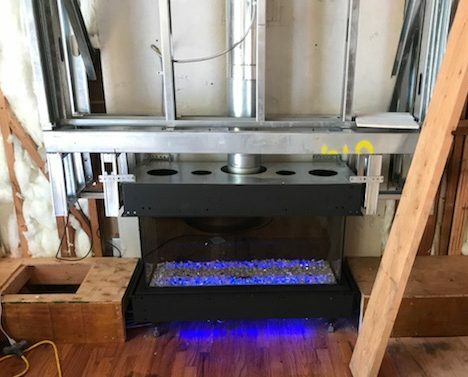 What are Min/max of the fireplace leg extension? The Fireplace is equipped with telescopic legs that can extend. When set to minimum the fireplace will be 3″ from the floor and the bottom of the glass will be 9″ from the floor. 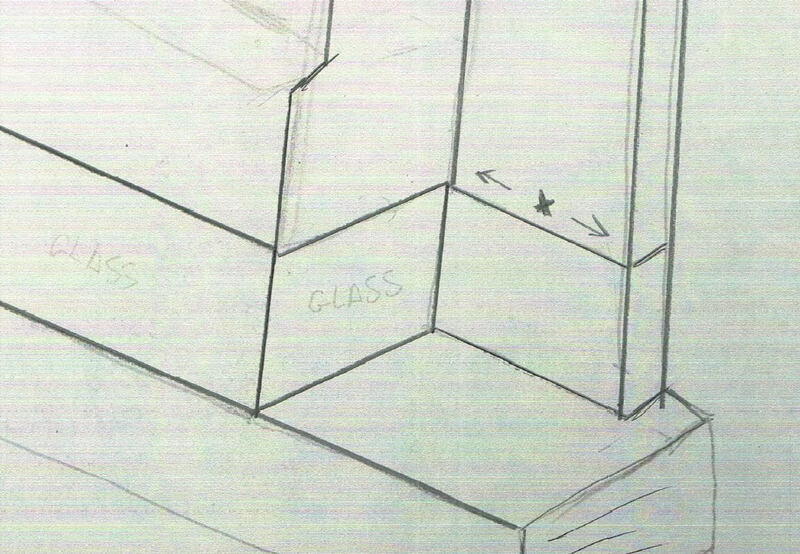 When set to max the bottom of the glass will be 18″ from the floor and the leg will be extended 12″.